I am attempting to embed list content into SharePoint pages/wiki pages that is stored on a separate site. I think some of this information might not be relevant, but I am going to include it so that you can get a better picture of what I am trying to achieve. There have been many, many variations of this question asked before, but I can't seem to find a solution that actually works for my scenario. Most of the solutions I've found seem to reference older versions of SharePoint Designer and the options I have been instructed to use either no longer exist or I can't locate where they've been moved to. I've spent the better part of the last year building out an internal resource center and intranet on SharePoint Online as part of our Office 365 subscription. The goal is to create a centralized location for any of our employees to lookup client and customer specific information quickly and easily. We handle financial collection for several different clients and each one has their own procedures and rules on how files are to be handled. The vast majority of this information is programmed into our on-site CRM and is not view-able or accessible to our call center employees. Our CRM exports everything stored in it into a SQL Database in near-real-time and we have this SQL database integrated so that the information we need is made available in several SharePoint lists. The purpose of this is so that our CRM Database administrator only has to update changes dictated by our clients one time in our CRM. Those changes made to the CRM are then pushed out to the SQL database so that the changes are populated in any other applications connected to the SQL database. For example Bank A, "Main Street Bank" instructs us to charge 4.00% interest on an acct. The data rules for "Main Street Bank" are updated in our CRM, and the change to 4.00% is automatically updated in the SharePoint List. 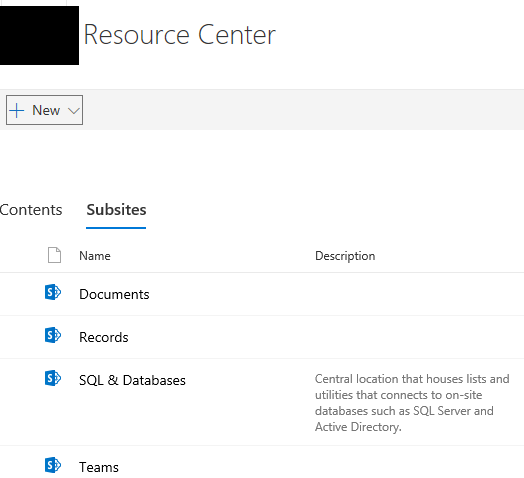 These SQL connected SharePoint lists are stored in a SubSite of our main Resource Center Site on SharePoint to prevent accidental tampering by anyone else in the company that shouldn't have access to a full dump of our CRM's SQL database. Under the Resource Center there are subsites for different teams, depts, etc illustrated here. I am building a template page for client specific information and attempting to have those pages pull the content from the lists stored in the SQL Database Site; that way on "Main Street Bank's" page it will display 4.00% and if they decide to change the interest rate then once it is updated in the CRM, its dumped to SQL, Synchronized with the SharePoint list and updated on the Bank's page without anyone needing to go and edit that page or any other page that references that information. I have found article after article and blog post after blog post that make it sound really simple to do this, but I have yet to find a solution that works. I've found several instructions that say I should use a Data View Webpart but the buttons are either grayed out or when I can insert the webpart, I can't edit the code. I've also tried creating the list view webpart that contains the data I want displayed on a page in the SQL Database subsite, then export the webpart and import it into the other subsite but I always get an error that the list doesn't exist. Lastly, I have investigated using the Cross Site Publishing Feature to turn the SQL Lists into Catalogs, but this appears to require new Site Collections to be created. I can go this route if it's the best solution, but our Office 365 Administrator isn't too keen on creating a new Site Collection. What is the best method to do what I am trying to do and if a resource already exists that has my solution where am I going wrong? Browse other questions tagged sharepoint-online sharepoint-designer content-query-web-part data-view-web-part sharepoint-list or ask your own question. Why don't Lists and Libraries show up in SharePoint Designer? Where does Sharepoint Designer 2010 store the Data Sources configuration?